Maximising ad visibility within a targeted audience is a crucial aspect of social media advertising. However, with so many users to potentially advertise to, how do you decide which cohorts of users to target? In theory, a Facebook advertising campaign has the power to reach 1 in 3 people – so hardly very targeted. Campaign managers must identify in advance the prospective audiences they wish to target as well as planning the most effective engagement techniques. 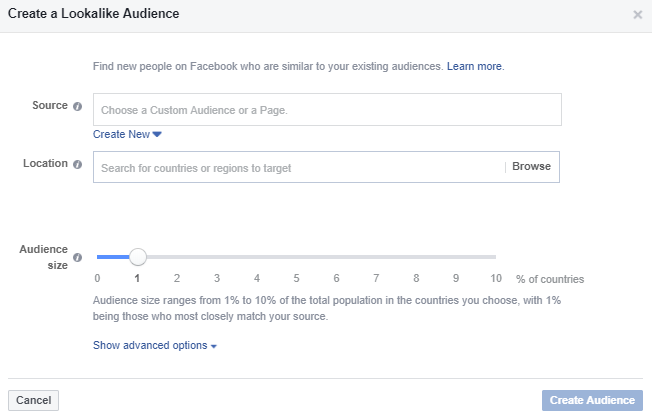 Luckily, Facebook provides an abundance of targeting metrics to help inform your decision over which groups to target. Marketing Signals Tip: Set up all your audiences you want to target, and save them with easy-to-find naming conventions beforehand. This will save time when setting up your campaigns as you can easily pull in your saved audience. Marketing Signals Tip: Overlay this information or dive even deeper into the metrics to further refine the audience – e.g. specify a target audience based on their political views, job titles, life events, etc. 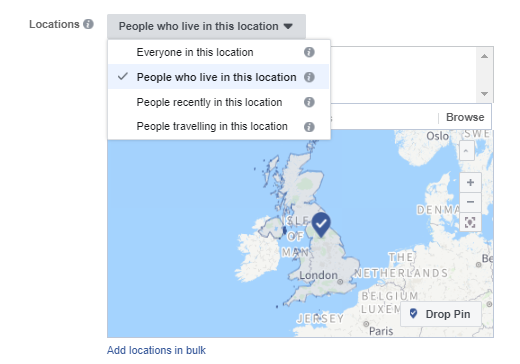 The default targeting option will promote ads to everyone within a selected area (Facebook establishes location via IP address). ‘People recently in this location’ – this is tracked using mobile device usage by location. ‘People traveling to this location’ – targets users who recently visited a location that’s at least 100 miles away from their home location. You can also ‘exclude audiences’ which allows you to hone in on a very specific location (such as a shopping centre) without wasting spend targeting the surrounding area. Marketing Signals Tip: If you have a variety of addresses you need to target in one ad group, you can use the bulk upload feature which will save you a lot of time. 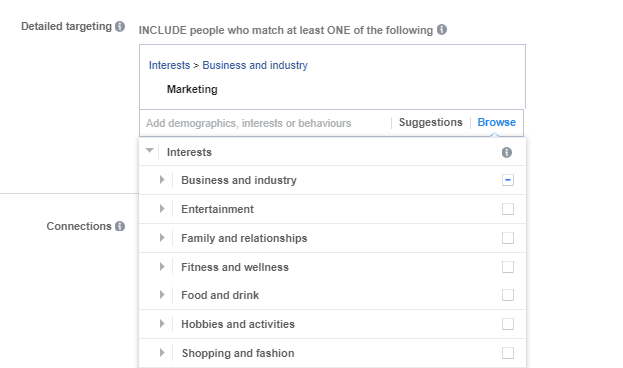 ‘Interests’ is one of the most popular targeting methods on Facebook. This feature allows campaign managers to target users who are interested in a specific subject. There are two ways to target users based on interests. Either scroll through the menu dashboard (which contains an abundance of interests) or simply type an interest into the search field. Facebook will then suggest similar interests that can be easily selected. Behaviours focus on a users activities on the platform – such as home, travel, charity, device usage etc. Customer Files – This revolves around pre-existing customer information and can include 15 different identifiers such as email address and phone number. Ensure that you receive and use the data correctly, according to GDPR guidelines. Website Traffic – Develop a remarketing campaign that targets website visitors. These tend to be ‘high-value’ audiences as the audience has already interacted with your brand and website in some way. App Activity –Facebook users may be targeted based on app interaction. To target these individuals, the app must first be registered with ‘app events’. Offline Activity –Create a list of users based on in-store interaction (via phone or other offline channels). For example, an estate agents can automatically show an advert with their latest house listings to individuals who have called to schedule a house viewing in the last 30 days. Lookalike audiences are another popular method of engaging with a set of users who share similar interests to the interests highlighted by an existing customer database. 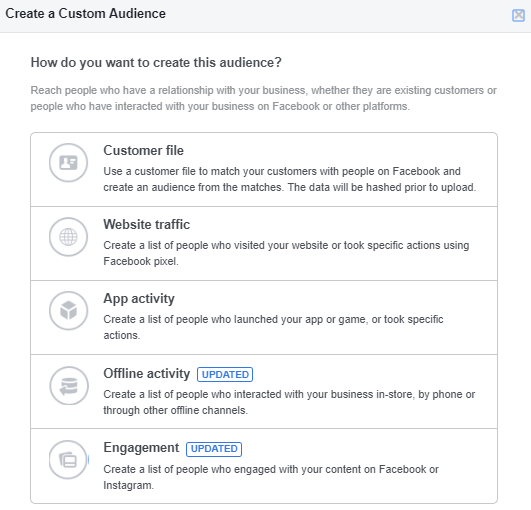 Facebook allows you to choose the size of the audience during the creation process. The smaller the audiences, the more closely matched your source audience is. Creating a larger audience increases the potential reach, however this also reduces the level of similarity between the Lookalike Audience and the source audience. Your Lookalike Audience will only include individuals within the country/countries that you’ve selected during creation. The audience must contain at least 100 users from a single country in order for Facebook to use it as the basis for a Lookalike Audience. Marketing Signals Tip: You can use a number of Lookalike Audiences at the same time for a single ad set. This will target your ads to users who are in any of the selected Lookalike Audiences. 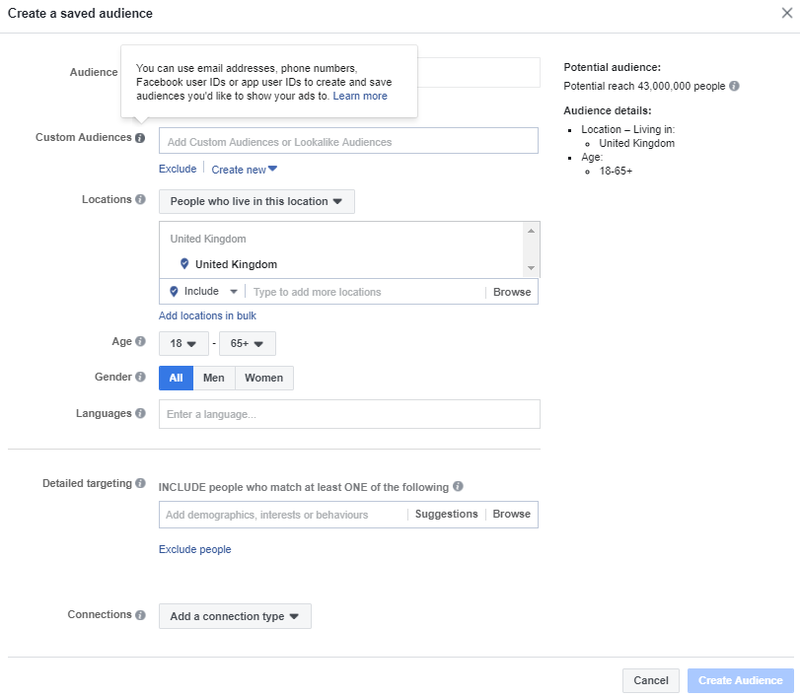 When setting up a Facebook campaign, it is imperative to spend time analysing audience data. You should only create ads that target the individuals most likely to purchase the product/service OR which meet your pre existing campaign goals as this will make the campaign run as efficiently as possible.